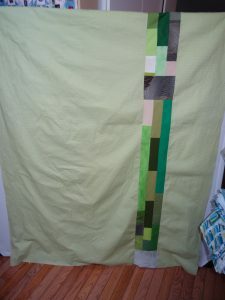 In my last exuberant posting about the quilt top being finished, I showed my choices for the back. Neither option included a no sew method. 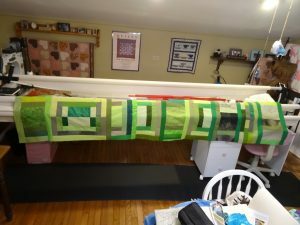 I decided to go with the 5 or so yards of light green and add to it. I can now boast that I did it, the King sized modern courthouse steps quilt back is finished. Let me show you how I went about doing it. First I gathered all the scraps. I had tons of them. 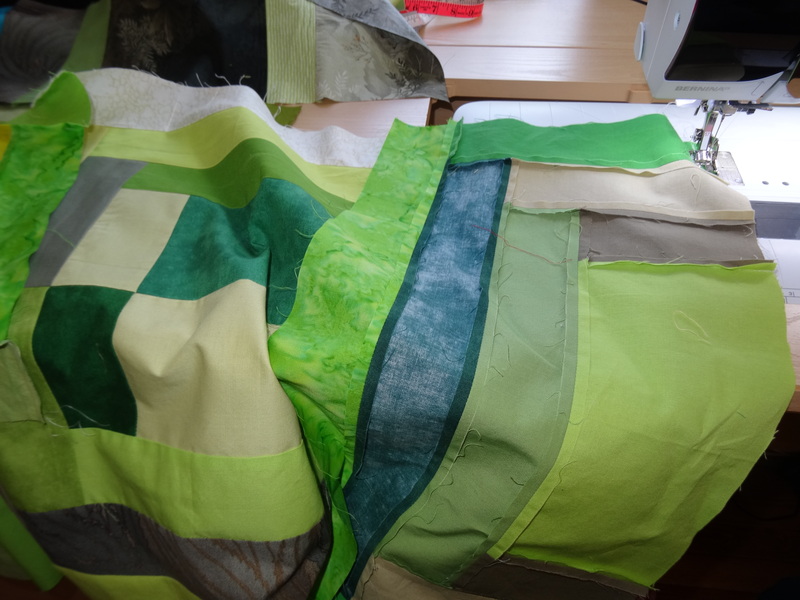 I had already sewn together enough strips for the binding so everything else was game. Luckily I had actual squares that I had made incorrectly, way to go! They were 20.5" wide so that was the width of the first strip. 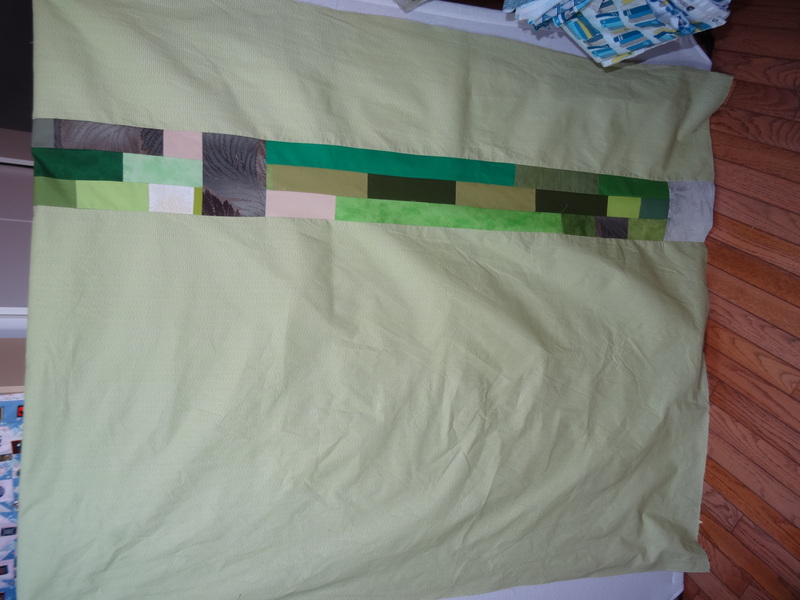 I kept sewing half blocks, strips and even full blocks together. 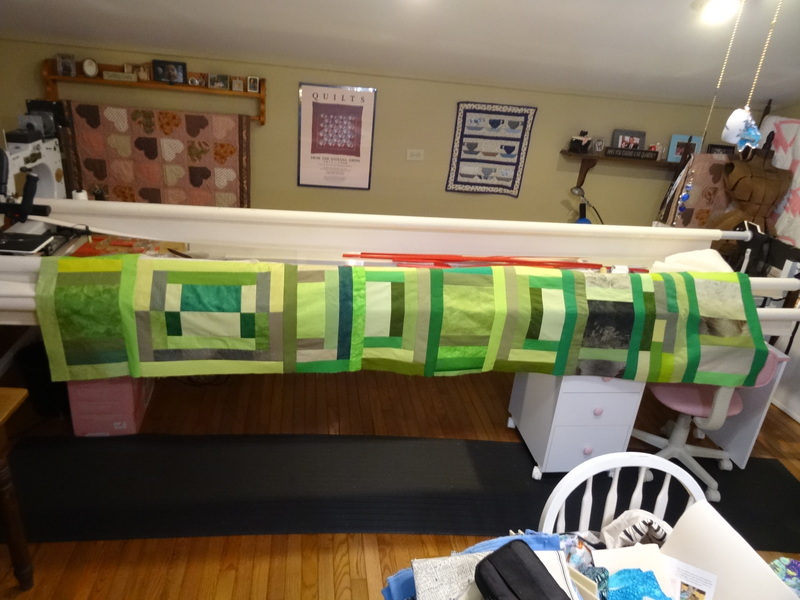 The length of the quilt is 100" by 120" so I needed to make the back slightly bigger. I planned for a 110" by 130" back that I will load on the longarm with the right side on the top. Here is the first finished strip. Aren't I lucky to have had so many good scraps? I also made a rectangle of the rest of the scraps. I used a few extra strips to make a skinny strip. I knew I needed 42" added to the fabric I had on hand. With the chunk, the skinny strip and the 20 inch strip, I had enough. I started piecing them to back pieces. I eventually had three large pieces. 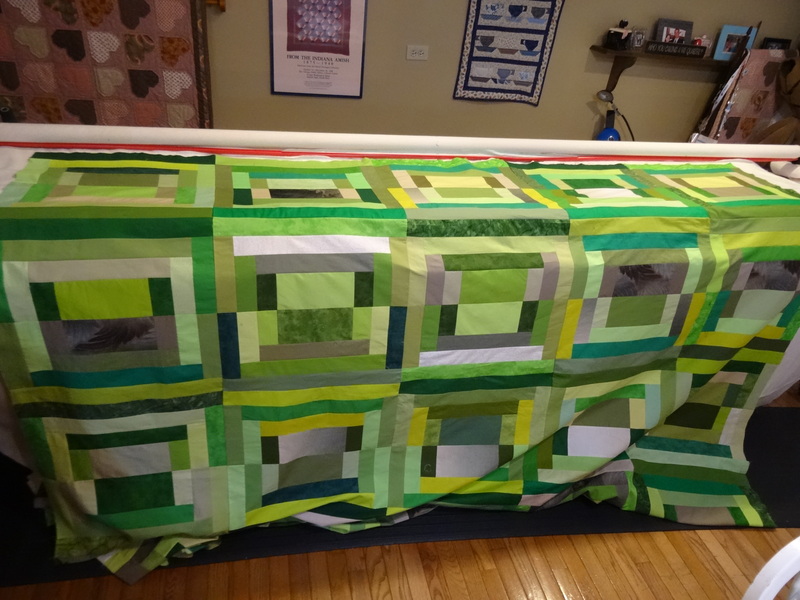 I kept measuring and would throw a strip in here and there as I sewed them together. I know that sounds a bit random but I guess it was. Some of the strips were slightly longer or shorter and I evened them up with strips. I ironed and ironed and then ironed some more. Big pieces of fabric are hard to keep unwrinkled. I loaded the back on the Garmmill with the help of my husband, it was just too much fabric for me to load by myself. Cliff also helped me load the batting, also a monster sized project. Finally we got the top loaded and we were both elated but tired. What a great feeling to have it all on my Gladys. I have already quilted over 20 inches, that's one sixth of the total. Go me! 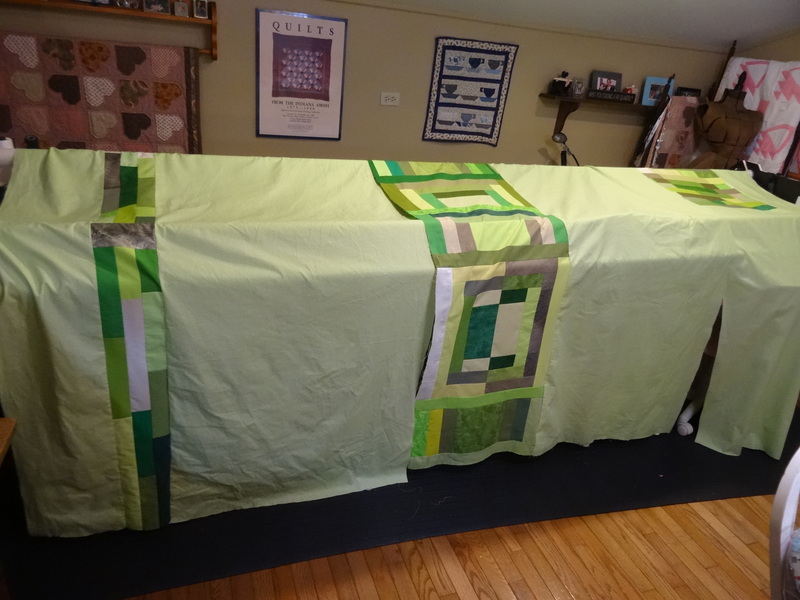 I have big chunky blocks so I am doing big chunky quilting. All the remaining strips were sewn onto the binding I had already made. I am in the process of ironing that. In the meantime, I keep quilting. I am thinking about what I will do with the tattered quilt, I want to rescue as much as I can. I also want new pillows on top of the bed. Lots of plans and sewing going on in my head. Head sewing is my favorite! The last time I made a king sized quilt, I hand quilted it. You can see a picture of me doing it here.